There are several car makers around today that have rich histories, but few have become a household name like the Ford Motor Company. We have gathered Ford brochures from many different decades that display the rich culture and the changing consumer tastes over the 100 years that Ford has been manufacturing cars and trucks. Henry Ford founded the Ford Motor Company in 1903. Henry’s vision form the very start was to build a car that the average American can afford to own. There were plenty of automakers at the time building cars for the wealthy and affluent, but Henry Ford’s goal is one that would change the world. Many people know that Henry and the Ford Motor Company built the Model T, which became the car of choice because the average consumer could buy his car and they did. In fact they purchased over 16 million of these cars between 1908 and 1927. That is an impressive number and we even have the Ford brochures and sales literature to give you a peek. Another one of the many innovations that Henry Ford brought to life to the entire manufacturing world was the assembly line, which he is still accredited for today. 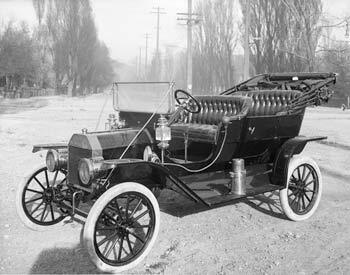 This was the ticket for being able to reduce costs and increase efficiency that made the Model T such an iconic car and a financial success for Ford. I think we even have Ford brochures that depict an early assembly line. However the success with the model T was just a notch in the belt of Ford and in 1925 Ford decided to enter the luxury market. This decision led to the purchase of the Lincoln Motor Company and forming a division to fill the niche in the mid-priced cars market with the Mercury line. The first successful endeavor with this new addition to the Ford Motor Company was the Lincoln Zephyr in the 1930’s that featured a V-8 engine and sold over 25,000,000 cars. This one won’t be included in the Ford brochures, but it will be in the Lincoln section. Another one of the vehicles for which Ford is well known is the Edsel. The Edsel was introduced in the late 1950s and it only lasted for 3 years. The Edsel was considered a failure at the time and for a while after that anything that failed was compared to the Edsel. 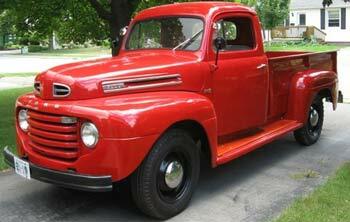 Fortunately we have some Edsel PDF Ford brochures here for your pleasure. However Ford did launch an iconic car in the 1950s known as the Thunderbird (or T-Bird). The Thunderbird was available with power windows and many other luxury features. Needless to say the Thunderbird was huge success and it even revised in the future, but without comparable success. Ford introduced several cars in the 1960s that kept its name on top of the sales charts. These two cars were the Falcon compact and priced for the budget minded and the other car was the Mustang. The Mustang was the hot car on the time because it was sporty and was available with a powerful V-8 engine. Mustang soon became the performance car of choice and it remained in production for many years and decades. We have pretty good collection of Mustang PDF Ford brochures below. Like so many other Automakers the 1970s was a turbulent time. Government regulations, oil crisis and consumer tastes required the Ford Motor Company to make some changes and quickly to keep from loosing ground. Then in 1979 Ford bought in to the Mazda Company, which brought them some global ties and technology not to mention their Ford brochures. With the 1970s in their rearview mirror the Ford Motor Company was once again looking to expand and grow the business. Things were looking up for Ford when they brought the popular Ford Taurus and Focus to the marketplace in the mid 1980s. They also brought new life to their ever-popular LTD when it was updated and renamed the Crown Victoria. At one time this car was staple of every police department and taxi service across the United States. You can witness these in the PDF Ford brochures found here. Ford continued to edge forward into the 1990s when they purchased Volvo and Land Rover and eventually Aston Martin and Jaguar. The ford Explorer on the late 90s and 2000s launched the era of the SUV and Ford was riding the wave. With these new acquisitions Ford was nipping at the heels of General Motors as far as becoming the number one automaker in the world. However it wasn’t long and things changed again including their Ford brochures and sales literature. The new century brought increased competition from the United States and Japanese auto manufacturers. Ford sales were down and so were profits. Ford started to tighten the belt and decided to sell off Aston Martin, Jaguar, Land Rover and Volvo. An internal restructuring was taking place that returned their attention to their own line of vehicles and their Ford brochures. Redesigns and introductions brought new life to the company and just in time when the recession of 2008-2009 hit the auto industry extremely hard. General Motors and Chrysler both turned to the U.S. government by declaring bankruptcy and it was believed that Ford would be next. GM and Chrysler received concessions and assistance by restructuring and government loans while Ford held their own. 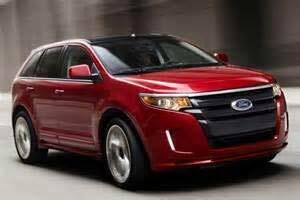 Ford has been continuing to move forward with new models, great styling and technology. The company has been experiencing great success with their line and ever popular Ford F150 which continues to be the best selling vehicle year after year. Take a look at the Ford brochures and sales literature below for a closer look at their lineup.